I wish I had the second book, but I got my copy at a garage sale ages ago. I read it in new-Norwegian which was a challenge because it's not native to me, but it fits the book very well. The characters are well rounded, and the book surprised me a few times, I had low expectations when I started it so all in all, a better read than I expected, funny at times and even though I am older than the target demographic, I can never pass up on a post-apocalyptic story. Though it was fairly well written, I felt it was highly unsatisfying for many minor reasons. I don't quite understand how this book got its award, but then again, I'm no 15-year old! 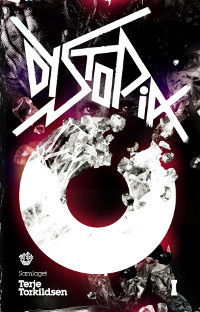 I will read Dystopia II and see if it can do better. En av de bedre norske ungdomstitlene jeg har lest! Terje Torkildsen - Terje Torkildsen is a norwegian author, lecturer, comedian and actor.He has written several books for young adults, and won the award UPrisen for his debut novel Marki Marco from 2008.He has done comedy since the early 1990s. As an actor he has appeared in norwegian movies like Mongoland, Alt for Egil and Monstertorsdag.